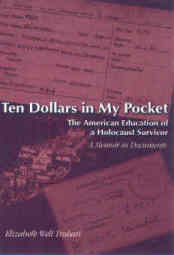 Ten Dollars in My Pocket is both an American success story and a description of the painful maturation process of a belated teenager, once on the verge of suicide, trying to discover who and where she is. This account is unique because of the authenticity of its narrative voice. We read diary entries and letters written during those years, as well as several eyewitness accounts published by the author at that time. This kaleidoscope of factual information is complemented by the author´s recollections and reflections. Elizabeth Welt Trahan, born in Berlin, Germany in 1924, lived in Czechoslovakia from 1929 to 1939 and in Vienna until her departure for the United States in 1947 - a time chronicled in her memoir, Walking with Gosts: A Jewish Childhood in Wartime Vienna (Peter Lang, 1998). With degrees in literature from Sarah Lawrence College, Cornell, and Yale universities, she taught at the University of Massachusetts, the University of Pittsburgh, the Monterey Institute of International Studies (MIIS) (where she founded the now famous School of Translation and Interpretation and received an honorary doctorate), and at Amherst College until 1993. Her publications include textbooks, translations, studies in German, Russian and Comparative Literature, and translation and interpretation methodology. Currently, she is on the steering committee of the New England Chapter of the National Writers Union.